Derek’s up for partner at Nibble & Kuhn just as that most proper of Boston law firms comically tries to ‘rebrand’ itself for the Google era. Pompous and arbitrary, the ruling junta of partners saddles him with a high visibility lawsuit just weeks before trial. The diligent young attorney arranges things so that Maria Parma, a new associate in the firm for whom he’s fallen hard, also gets named to the case. Maria, in turn, can’t keep her hands off Derek, but it’s complicated because she’s engaged to someone else. As Derek prepares his case on behalf of seven young victims of an industrial polluter, his anxieties about his career and his torments over Maria’s mixed messages only increase. Have his eccentric WASP superiors handed him a ‘toxic’ case to ruin his chances of becoming a partner? How can he get his opponents to settle – an outcome the presiding judge all but demands – unless his unorthodox ‘expert witnesses’ perform with enough gravitas to match that of the other side with its Harvard Medical School scientist? 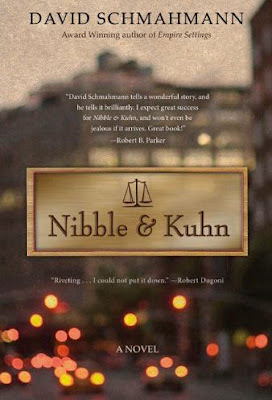 Will Nibble & Kuhn survive the partners’ spectacularly bad business judgments? Does it even matter to Derek, given that his looming fiasco of a trial and his indiscretions with Maria seem set to sink any chance he ever had at partnership?